They unwind a region of a DNA molecule. They initiate and end mRNA synthesis. They also modify the mRNA after the completion of transcription. (a) RNA Polymerase I is located in the nucleolus and transcribes (Ribosome RNA) ribosomal RNA (rRNA). (b) RNA Polymerase II is located to the nucleus. It transcribes messenger RNA (mRNA) and most small nuclear RNAs (snRNAs). (c) RNA Polymerase III is localized to the nucleus. It transcribes transfer RNA (tRNA) and other small RNAs (including the small5S rRNA). (a) The site of DNA where DNA polymerase attaches is called promoter. Promoter is normally composed of 50 nucleotides. It is present at the start of gene. The promoter for polymerase II contains a TATA box. The TATA box binding protein (TBP) recognizes TATA boxes and attached the RNA polymerase on promoter. (b) At this stage, the DNA is double-stranded (“closed”). This RNA Polymerase/wound-DNA structure is called closed complex. (c) The DNA is unwound and becomes single-stranded (“open”) near initiation site. This RNA Polymerase/unwound-DNA structure is called the open complex. (d) The RNA polymerase transcribes the DNA, but produces about 10 abortive nucleotides (transcripts). These are unable to leave the RNA polymerase because the exit channel is blocked by the alpha-factor. (e) The alpha-factor of RNA polymerase dissociates from the holoenzyme and elongation starts. RNA polymerase starts joining complementary ribose nucleotides to the 3’ end of the DNA strand. These same complementary bases paired in DNA. But in RNA, the base uracil replaces the base thymine. Thus, uracil complements to adenine. Newly RNA transcripts use adenosine-5’-triphosphate (ATP), guanosine-5’-triphosphate (GTP) (purine nucleoside triphosphates). Uridine-5’-triphosphate (UTP) and cytidine-5’-triphosphate (CTP) (pyrimidine nucleoside triphosphates). (a) Rho-Independent Termination: It involves the terminator sequences within the RNA that signal the RNA polymerase to stop. The terminator sequence is usually a palindromic sequence. It forms a stem-loop hairpin structure. It dissociates the RNA polymerase from the DNA template. One such common termination is palindromic sequence ‘GCCGCCAG’. The polymerase fails to proceed beyond this point. Therefore, the absent DNA-RNA hybrid dissociates. (b) Rho-Dependent Termination: In this case, termination factor called rho factor stop RNA synthesis at specific sites. This protein binds and runs along the mRNA toward the RNA polymerase. When rho-factor reaches the RNA polymerase. it dissociates RNA polymerase from the DNA, terminating transcription. 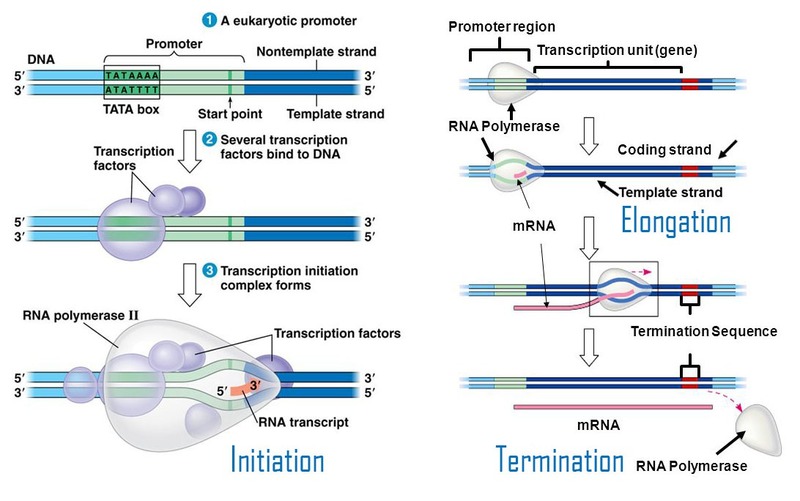 The newly transcribed mRNA is called the primary transcript. It is modified before leaving the nucleus. Some base sequences in newly transcribed mRNA do not code for proteins. RNA splicing cut out these noncoding regions. Thus, the mRNA coding region can be read continuously at the ribosome. (a) In Prokaryotes: The newly synthesized mRNA is directly released into the cytoplasm in bacteria. It is converted into polypeptide chain in cytoplasm. (b) In eukaryotes: The mRNA in eukaryotes has to travel from inside the nucleus to ribosomes outside in the cytoplasm. Therefore, eukaryotic mRNA is modified in several ways. These modifications help it in its journey. A cap and a tail are added. Thus, the molecule remains stable during long journey to ribosome. The caps and tails save the mRNA from the action of variety of nucleases and phosphatases enzymes. Cap: It is in the form of 7 methyl GTP. It is linked to 5′ end with the first nucleotide of mRNA. Tail: It is in the form of poly A tail. It is linked to 3′ end of the RNA.